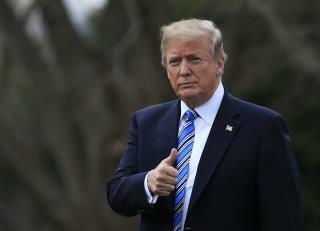 (Newser) – President Trump offered support Monday for an effort to strengthen the federal gun background check system. Press secretary Sarah Huckabee Sanders said the president spoke on Friday to GOP Sen. John Cornyn about a bipartisan bill designed to strengthen the FBI database of prohibited gun buyers, the AP reports. "While discussions are ongoing and revisions are being considered, the president is supportive of efforts to improve the federal background check system," Sanders said in a statement. Surviving students of last week's Florida shooting are ramping up pressure on Trump and lawmakers to toughen the nation's gun laws. The bipartisan background check legislation would be aimed at ensuring that federal agencies and states accurately report relevant criminal information to the FBI. The measure was introduced after the Air Force failed to report the criminal history of the gunman who slaughtered more than two dozen people at a Texas church. Trump has been a strong supporter of gun rights and the NRA, and he has focused his comments on mental health, rather than guns, but last year he signed a resolution blocking an Obama-era rule designed to keep guns out of the hands of certain mentally ill people. In a marathon series of furious weekend tweets from Mar-a-Lago in Florida, Trump vented about Russia, raging at the FBI for what he perceived to be a fixation on the Russia probe at the cost of failing to deter the attack on a Florida high school. Guns are the problem. Not people. Ignore that silly quip that the NRA tells you; it is the gun that kills. A gun left unattended can kill without the help of a persons will. The gun contains an explosive, and under certain circumstances will kill without warning. An innocent child or family pet can unintentionally bump into it causing it to drop and fire a shot that kills. Extreme heat can cause ammunition to explode. Hair triggers are susceptible to sending off a round. It is a dangerous hazardous thing to be left alone, in addition in the hands of any irresponsible person. Every person in America is a potential bad person, and can turn into your worst nightmare at any instant. Therefore there is no such person as a bad guy with a gun, until he suddenly becomes one. That is another NRA quip you can toss in the can. Any one who believes that having the privilege to own an assault rifle without regard for the safety of human life, is the direct cause of the problem we have in America. That was certainly not the intent of the founders, nor should it be now. All AK47, AR47, automatic, and semi automatic weapons intended for use on other human beings should be banned from our country; period. If you still want to have your assault weapons after all the killing of innocent children and the destruction of families and friends, then you are the problem. Maybe a beefing up would stop the FBI from ignoring tweets that show severe mental illness. Therefore, they would prohibit anyone from selling an automatic weapon to donald trump.